Members of the Long Beach Unified School District Board of Education visited four schools and the Teacher Resource Center for a close look at the day-to-day work of students, teachers, support staff and administrators. The school board visited Grant Elementary School and Newcomb Academy on Jan. 11, meeting school leaders and visiting classrooms. A second round of visits on Jan. 25 began with a visit to the Teacher Resource Center to observe school teams engaged in professional development, or training. Then the board members traveled to McBride High School and Washington Middle School, again meeting school leaders and visiting classrooms. “I was most impressed when we went into a math class, and the passing bell had not yet rung,” school board Vice President Jon Meyer said of his visit to Washington Middle School. “We took our seats. Here came these good looking kids in their uniforms, all of them with their computers out, and already on the overhead was their assignment: Anatomy of a Hurricane. How can we use linear equations to model important characteristics of hurricanes? How accurate are these models in predicting a hurricane’s behavior? 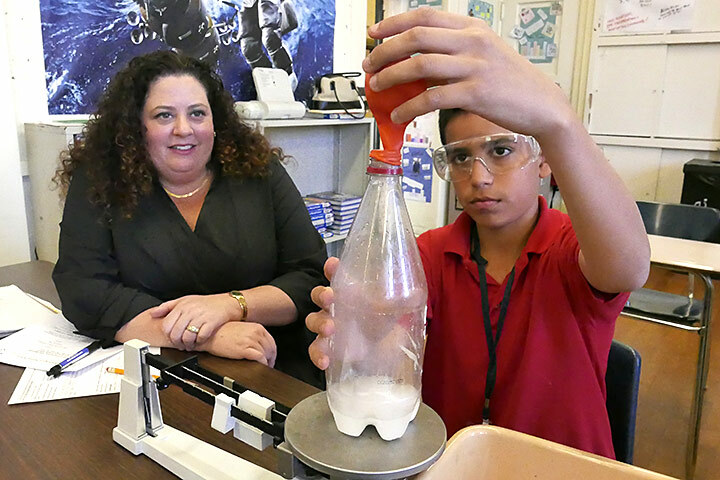 FACTS OF THE MATTER – Megan Kerr of the school board observes as Washington Middle School eighth grader Johnny Juarez proves the law of conservation of mass. Board members visited classrooms at several schools.